I heard of a man who carried a little black book in his pocket where he kept a record of all the unloving and insensitive things his wife had done to him over the years. Yesterday I realized that I also have a little black book where I keep a record of things. 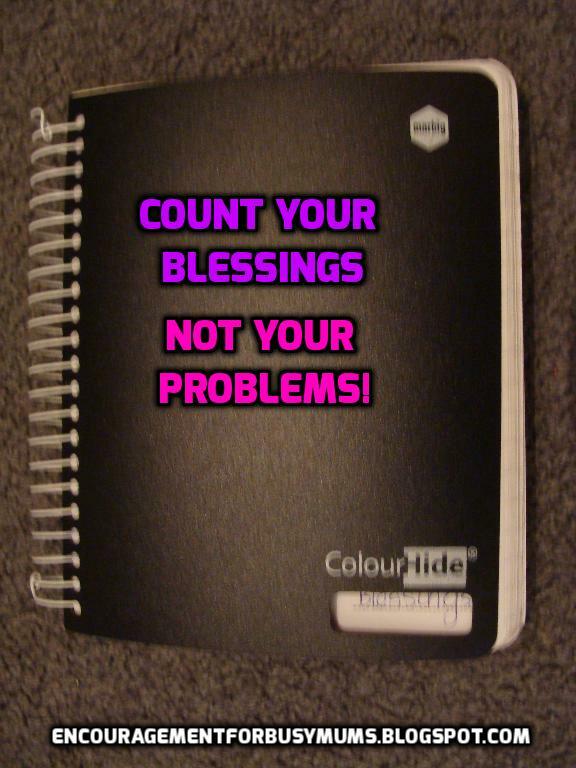 This little black book is called "Blessings". I got the idea from someone a few years ago, and it has helped me with having a better perspective. I so easily focus on the negative. Jotting down your blessings helps you to look for them and helps you to realize just how many you have. I especially find this helpful in my marriage. My husband is very different to me and its super easy to get offended or have unrealistic expectations. It sometimes hits me that my husband must simply find me impossible to please! But when I write down all his positive points and the many ways he shows love.... I realize just how blessed I am. I can be more appreciative and thankful instead of being critical and ungrateful. It completely changes my perspective! This week has been a challenge since I was knocked off my feet with a nasty flu. I was reminded again just how important it is to count my blessings. Its amazing the difference it makes! When I remembered to start making the list, it didn't seem so bad after all. A little black book can be a bad thing or a very good thing.